It is that time of year for MLS Soccer again. With training camps starting up soon, it’s time to examine the picks from the Super Draft. How did the Dynamo do during the selection process? While the season ended a bit on the bitter side for the Houston Dynamo, it wasn’t a complete loss. Sure, the team performed below expectations. However, they proved that when healthy and in sync, it is a dangerous squad to deal with. With all of that in mind, let’s review some points from last season. Who has departed the team, and did Houston address their needs in the draft? Well, it was quite a mixture of feelings regarding this past season for the Dynamo. Perhaps the highlight was winning the U.S. Open Cup against the Philadelphia Union in October. However, the disappointment of it all was a bit more memorable. For starters, the Dynamo were coming off a Western Conference Finals appearance. In fact, the team was still mathematically alive up until the last game against the L.A. Galaxy. Alas, while they denied the Galaxy a playoff spot, the mountain was too high to climb for Houston. Offensively, the team was capable of putting in at least two goals a game. 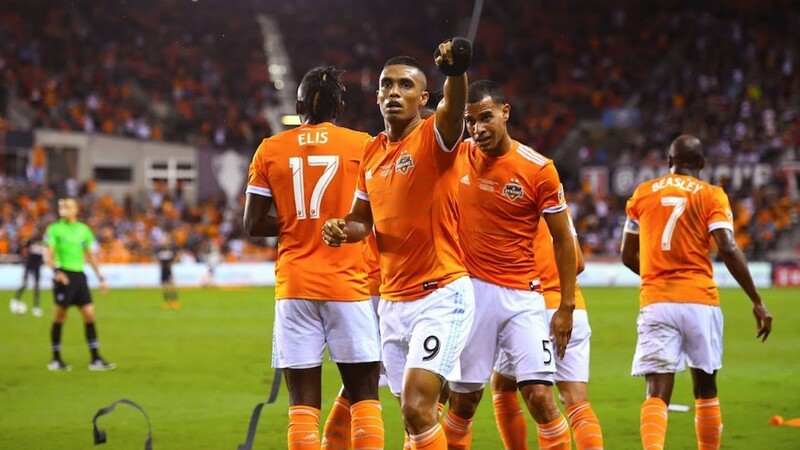 Mauro Manotas, Alberth Elis, Romell Quioto, and Tomas Martinez were electric on the attack. The latter, being mostly Martinez, missed some time due to injury. More on that in a bit. In the midfield, led by the aforementioned Martinez and Elis on the wing, was mostly solid. There were times when the midfield was too relaxed defensively. Again, however, not their fault. As a matter of fact, the back line did not deserve so much backlash either. Which leads us to the real downfall of the 2018 season for the Dynamo. A constant theme that surrounded Houston can be categorized into one word. What is that word? Injuries. Unfortunately, the squad was ravaged by injuries to many key back line members and the Dynamo’s top midfielder. Some of these injured players included Juan David Cabezas, Tomas Martinez, and the versatile Andrew Wenger, who announced his retirement at the end of the season. Given the number of injuries, it is possible to say that the Dynamo had an uphill battle from the start. After all, the season began with a victory over eventual the MLS Champion, Atlanta United. Despite the fight they displayed, the injury bug won. While the injury bug became a huge headache, the off-season took a few more shots at the Dynamo roster. As mentioned before, Andrew Wegner announced his retirement at season’s end. However, injury was not the only thing that took out defender Dylan Remick. At season’s end, the versatile defender announced he too would retire. Just how important was Remick? In his first season in orange and white, Remick was among the best defenders the Dynamo had. That was the same season Houston went to the West Finals. In other words, pretty important. However, the Dynamo added two players in particular that were interesting. The first was Alijaz Struna. The former Palermo defender from Slovenia could prove to be a vital signing. Relatively unknown, Struna played in Italy, often times considered the Mecca for defensive football. Given his experience in Italian Football, Struna’s defensive ability is something to look for this upcoming season. After all, Italian leagues pride themselves when it comes to defense. The next man is an established MLS player. Left-Winger Tommy McNamara. You may remember him from his years as a staple player for New York City FC. Why is this name so important? Well to be fair, since joining NYCFC in 2014, McNamara has enjoyed some of the best years of his career. The man creates great ball movement. In four seasons in the Bronx, McNamara scored 13 goals and assisted on 12. He possesses great vision, strong mental I.Q., and can play a variety of positions in the midfield and attacking third. However, there is one more player to look out for this upcoming season. Ronaldo Pena. A young and promising Venezuelan striker who recently spent a season in the Portuguese top flight while on loan. The Dynamo recently acquired his rights from his home club, Caracas F.C. in Venezuela. His experience in the first division of the Portuguese league will prove vital. For the 2019 Super Draft, Houston selected in three of the four rounds. Two defenders and a midfield player. Further evaluating the Dynamo’s selections, I’d say the needs they addressed were due to the number of injuries the team sustained last season. And that, indeed, is a smart move. The Round 1 pick was defender Sam Junqua from the University of California. The eighth overall pick, Junqua played four full seasons at Cal and was a constant face in the squad. A stout defender at six foot, Junqua could prove to be important defender in the future. Given the injury history of Dynamo back line, that time may come sooner rather than later. Next up at 33rd overall, in Round 2, defender Andrew Samuels. The University of Maryland defender also enjoyed consistent years. Similar to Junqua, Samuels is a versatile defender, who is just a bit shorter and lighter. Again, a move made for the future, however, with emphasis on the injury history of the back line. Both selections should prepare for call ups and prove to be helpful. Finally, is the Round 3 pick. Selected at 56th overall, Brad Dunwell, midfielder from Wake Forest University is an interesting selection. A nice option to develop for the future. Dunwell possesses great vision and proved to be viable assist man in the middle. Overall, three decent selections aimed towards addressing depth issues, as well as preparing for the future. As a matter of fact, it is a good thing Houston did not focus on pure offense. This time the focus was bolstering the defense, and adding another creative midfielder to grow and polish. While these names aren’t household names, you may know them someday. And who knows? These guys may appear before the fans sooner than expected. Orange nation, let’s welcome the new signings, and aim for an awesome 2019 season. Good luck lads. See you March 3rd for opening day against Real Salt Lake.